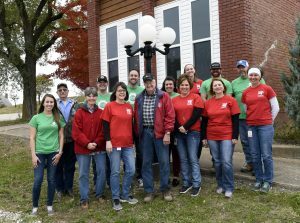 MACON, MO – Chariton Valley (CV) and Macon Electric Cooperative (MEC) provide telecommunication and electric services respectively. They also reach the heart of communities they serve by volunteering where needed through a program called ‘Co-ops in Action’. Their sixth project since inception, MEC and CV worked together in the small town of Ethel to clean and paint the decorative lamp posts along main street and made repairs inside the City Hall Building which included waterproofing the basement and repairing a door. Through Co-ops in Action, MEC and CV dedicate time and employees to tackle work projects in the communities that are serviced by the two organizations. Projects are selected through a request process. Applications for Co-ops in Action may be found at www.maconelectric.com, or www.cvalley.net. Groups or organizations who need assistance with a project may apply to have work completed through Co-ops in Action. The organization must provide the material needed for the project, while MEC and CV provide the labor. “We really appreciate the work you did,” stated City Clerk, Debbie Atha. “Fixing the door will help keep it warm for elections and occasionally we rent out the hall, so it will be nice for that as well. The basement had junk and mold in it, so this will help seal it. It’s a wonderful thing you do for communities,” she concluded.